The Initiates Way series of paintings is currently showing at the Florence Arts Centre in Egremont. The paintings will be on show until the end of April if you would like to go and see them for yourself. It is free to attend the exhibition. 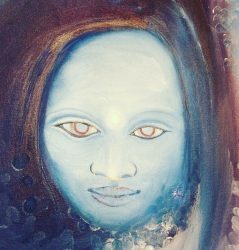 Each of the paintings has a guided meditation that accompanies it and if you would like to try this for yourself in your own sacred space they are available on the youtube channel. On the 22nd of March I will be facilitating an Esoteric Art workshop at the Florence Arts centre for anyone who would like to learn how to Meditate before creating Art. Esoteric Art simply means art that comes from within. Learning to meditate was the first hurdle for me as an artist to access that space within that allows creation from the heart. There doesn’t need to be any specific outcome or idea of what will be created, it is simply engaging in the process which is the act of creating. Stimulating the source of inspiration within and expressing emotion through colour and technique. If you would like to come along to the workshop all you will need is blank canvas / sketchbook in a size of your choosing, or canvas boards and whichever medium you like to work in. Fo example, you could bring some acrylic paints…watercolours…chalks or pastels… oil paints. Whatever works for you. Brushes are not a neccesity as we will probably use fingertips to connect with colour and express. I will guide and instruct on how to begin breathing and visualization techniques which allow you to ground and centre within yourself, and create a sacred space from which to begin your art. Suitable for children aged 12+ (under 16s must be accompanied). Places are limited so booking is recommended.